Does the past matter? When confronted by facts that are uncomfortable, but which relate to people long dead, should we put them aside and, to use a phrase very much of our time, move on? And there’s a separate, but related, question: how should we treat the otherwise admirable thought or writings of people when we discover that those same people also held views we find repugnant? Those questions are triggered in part by the early responses to Pantheon, my new novel published this week under the pseudonym Sam Bourne. The book is a thriller, set in the Oxford and Yale of 1940, but it rests on several true stories. Among those is one of the grisliest skeletons in the cupboard of the British intellectual elite, a skeleton that rattles especially loudly inside the closet of the left. It is eugenics, the belief that society’s fate rested on its ability to breed more of the strong and fewer of the weak. So-called positive eugenics meant encouraging those of greater intellectual ability and “moral worth” to have more children, while negative eugenics sought to urge, or even force, those deemed inferior to reproduce less often or not at all. The aim was to increase the overall quality of the national herd, multiplying the thoroughbreds and weeding out the runts. Such talk repels us now, but in the prewar era it was the common sense of the age. Most alarming, many of its leading advocates were found among the luminaries of the Fabian and socialist left, men and women revered to this day. Thus George Bernard Shaw could insist that “the only fundamental and possible socialism is the socialisation of the selective breeding of man”, even suggesting, in a phrase that chills the blood, that defectives be dealt with by means of a “lethal chamber”. Such thinking was not alien to the great Liberal titan and mastermind of the welfare state, William Beveridge, who argued that those with “general defects” should be denied not only the vote, but “civil freedom and fatherhood”. Indeed, a desire to limit the numbers of the inferior was written into modern notions of birth control from the start. That great pioneer of contraception, Marie Stopes – honoured with a postage stamp in 2008 – was a hardline eugenicist, determined that the “hordes of defectives” be reduced in number, thereby placing less of a burden on “the fit”. Stopes later disinherited her son because he had married a short-sighted woman, thereby risking a less-than-perfect grandchild. Yet what looks kooky or sinister in 2012 struck the prewar British left as solid and sensible. Harold Laski, stellar LSE professor, co-founder of the Left Book Club and one-time chairman of the Labour party, cautioned that: “The time is surely coming … when society will look upon the production of a weakling as a crime against itself.” Meanwhile, JBS Haldane, admired scientist and socialist, warned that: “Civilisation stands in real danger from over-production of ‘undermen’.” That’s Untermenschen in German. I’m afraid even the Manchester Guardian was not immune. When a parliamentary report in 1934 backed voluntary sterilisation of the unfit, a Guardian editorial offered warm support, endorsing the sterilisation campaign “the eugenists soundly urge”. If it’s any comfort, the New Statesman was in the same camp. According to Dennis Sewell, whose book The Political Gene charts the impact of Darwinian ideas on politics, the eugenics movement’s definition of “unfit” was not limited to the physically or mentally impaired. It held, he writes, “that most of the behavioural traits that led to poverty were inherited. In short, that the poor were genetically inferior to the educated middle class.” It was not poverty that had to be reduced or even eliminated: it was the poor. Hence the enthusiasm of John Maynard Keynes, director of the Eugenics Society from 1937 to 1944, for contraception, essential because the working class was too “drunken and ignorant” to keep its numbers down. We could respond to all this the way we react when reading of Churchill’s dismissal of Gandhi as a “half-naked fakir” or indeed of his own attraction to eugenics, by saying it was all a long time ago, when different norms applied. That is a common response when today’s left-liberals are confronted by the eugenicist record of their forebears, reacting as if it were all an accident of time, a slip-up by creatures of their era who should not be judged by today’s standards. Except this was no accident. The Fabians, Sidney and Beatrice Webb and their ilk were not attracted to eugenics because they briefly forgot their leftwing principles. The harder truth is that they were drawn to eugenics for what were then good, leftwing reasons. They believed in science and progress, and nothing was more cutting edge and modern than social Darwinism. Man now had the ability to intervene in his own evolution. Instead of natural selection and the law of the jungle, there would be planned selection. And what could be more socialist than planning, the Fabian faith that the gentlemen in Whitehall really did know best? If the state was going to plan the production of motor cars in the national interest, why should it not do the same for the production of babies? The aim was to do what was best for society, and society would clearly be better off if there were more of the strong to carry fewer of the weak. What was missing was any value placed on individual freedom, even the most basic freedom of a human being to have a child. The middle class and privileged felt quite ready to remove that right from those they deemed unworthy of it. Eugenics went into steep decline after 1945. Most recoiled from it once they saw where it led – to the gates of Auschwitz. The infatuation with an idea horribly close to nazism was steadily forgotten. But we need a reckoning with this shaming past. Such a reckoning would focus less on today’s advances in selective embryology, and the ability to screen out genetic diseases, than on the kind of loose talk about the “underclass” that recently enabled the prime minister to speak of “neighbours from hell” and the poor as if the two groups were synonymous. Progressives face a particular challenge, to cast off a mentality that can too easily regard people as means rather than ends. For in this respect a movement is just like a person: it never entirely escapes its roots. 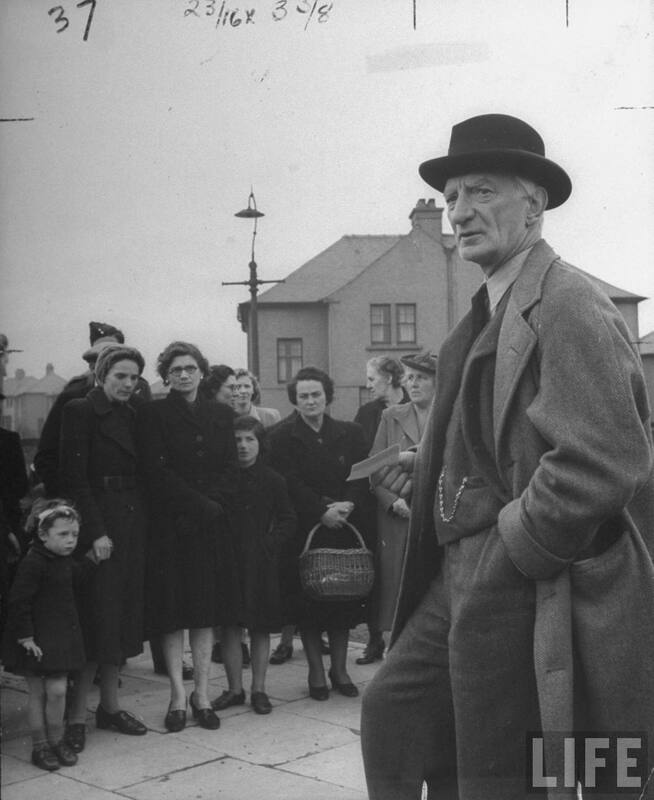 Photograph of William Beveridge by Hans Wild (Time & Life Pictures/Getty Images).